I hope you all had a fantastic Thanksgiving full of delicious food, family, and friends this past weekend. The Holiday months always seem to fly right by. I always find myself in awe when the month of December arrives, not knowing where the time went. There are two times out of the year where we decorate the entire house, Halloween and Christmas. Lucky for me, I have a festive husband who loves decorating the house as much as I do, especially after we had kids. The excitement in their eyes as they help us decorate inside and out brings joy to our eyes. Knowing how much traveling we’ll be doing this month, and in order to maximize the use of our decorations, we decided to get ahead of the game and fully decorate our house for Christmas before leaving for Thanksgiving. This means that come today, December 1st, I’m in full Christmas mode and my minds exploding with plans and ideas! Crafts and baking with the kids, planning our annual Christmas Party with friends, and preparing homemade treats to pass out to friends, neighbors, teachers, and anyone else who happens to stop by our house this month, including our local UPS guys who work ever-so-hard this month delivering packages on time to everyone’s doorstep. 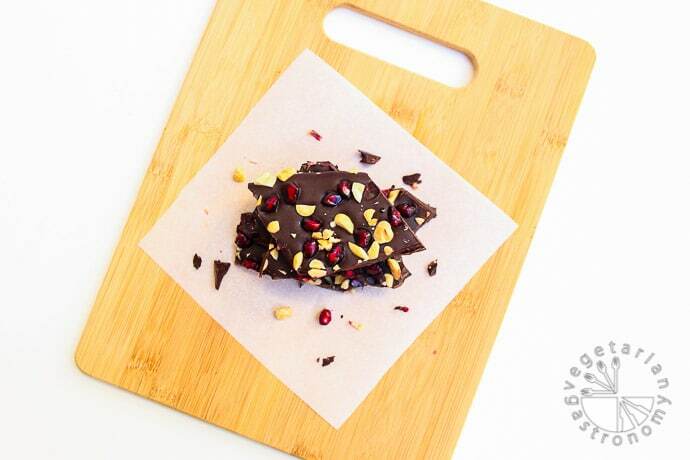 To start off this festive month, I’m excited to share my new favorite holiday bark recipe! 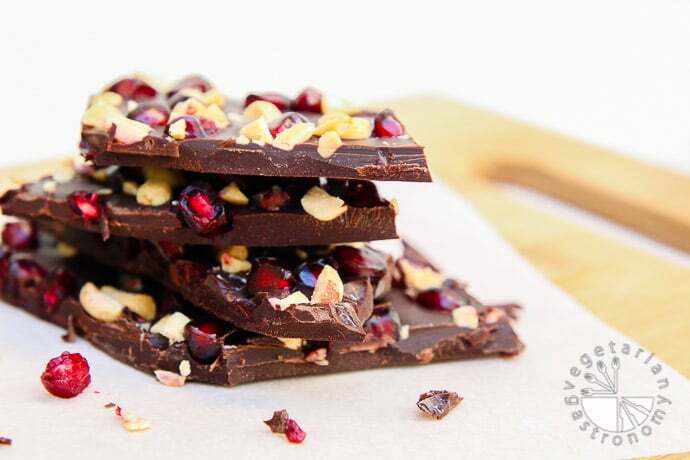 Pomegranate Pearls, Roasted Peanuts, and Dark Chocolate all come together to create this wonderful bark combination. 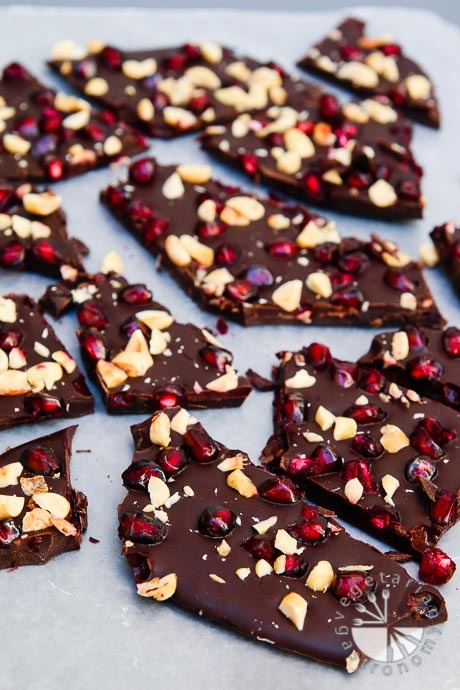 It is by far my most favorite bark creations and is very addicting, especially since we have pomegranates galore growing in our front yard. The best part of this recipe is that it’s very easy to make. The pomegranate pearls always look breathtaking, making them the perfect treat to pass out this Holiday Season. This bark came about because we had about 30 delicious large pomegranates growing in our front yard this season and some extra melted dark chocolate left over from making these fun googly eyes and frozen chocolate covered banana slices with my kids. 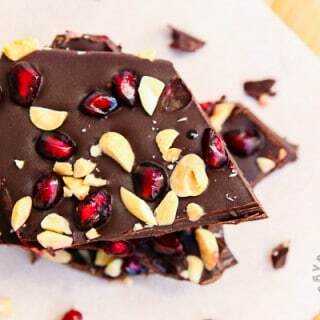 Not wanting to waste any melted dark chocolate, I started searching around my kitchen for what else I could coat with dark chocolate, because of course, everything tastes better coated in dark chocolate =) My eyes came across some pomegranate seeds I had harvested earlier and I knew it was going to be a winner. After polishing off the result myself, I knew I had to re-create a proper version and make it into some Holiday Bark. 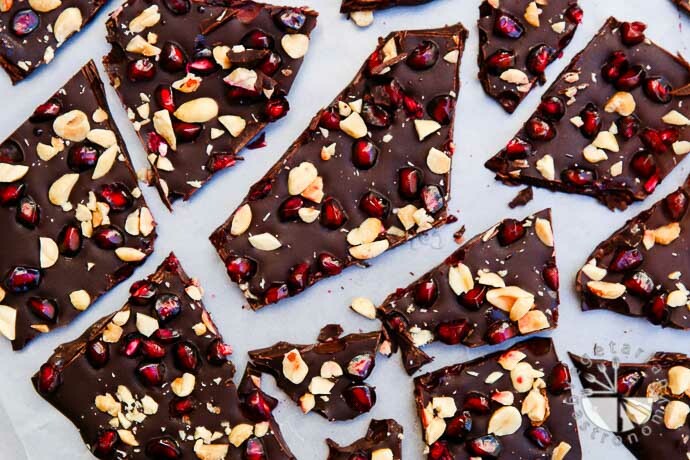 I started experimenting with other flavors to add to the chocolate and pomegranate seeds and found my way over to some dry-roasted peanuts. To be quite honest, peanuts are typically not my nut of choice. However, with this combination, it has quickly made it’s way up on my list. 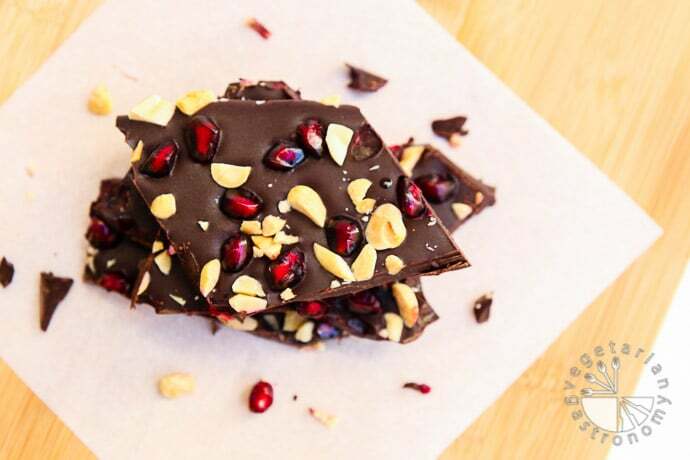 The flavor of the peanuts compliments the pomegranate seeds and dark chocolate perfectly! If you need a quick Holiday Treat to make this season this is the one! Pass it out to friends and family, make it for your Holiday party, package it up for your kids teachers, or simply leave some laying out in your kitchen. I guarantee it will be gone quickly and you’ll find yourself making another batch. 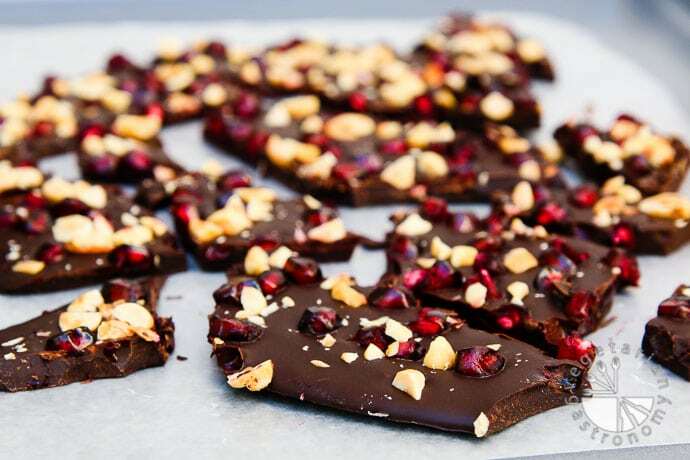 This bark contains fresh pomegranate seeds and should therefore be stored in the fridge and will not last as long as typical chocolate barks made with dry ingredients. Although I’m pretty sure you will not have to worry about it spoiling, because it will be gone before you know it. Enjoy! Meet my favorite fast and easy combination and candy to pass out during the holidays! 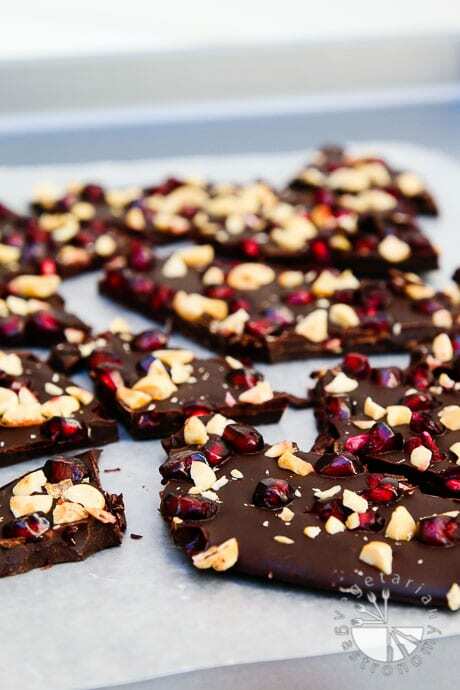 The gorgeous pomegranate pearls combined with crunch peanuts and dark chocolate! Using a double broiler, melt the dark chocolate chips until completely smooth, mixing frequently. See notes below for double broiler method. Poor the melted chocolate onto the prepared baking sheet. Gently tap the tray on the counter-top to even out the thickness of the mixture. Feel free to tilt the tray back and forth to spread out the chocolate to desired thickness. But be sure to keep it thick enough so it remains a bark when cut into pieces. Evenly sprinkle on pomegranate seeds and the chopped roasted peanuts. Press them down gently. Refrigerate for about an hour or two until the chocolate is completely firm. Break the bark into squares and enjoy! Store them in the fridge. Storage - This bark contains fresh pomegranate seeds. Therefore, it should be stored in the fridge and will not last as long as long as other barks with non-perishable ingredients. Chocolate - I prefer to use vegan Enjoy Life Dark Chocolate Chips , which come in 9 oz. bags (unless you buy their gigantic 5 lb bag). This is about 1 1/2 to 2 cups chocolate chips. Chocolate bark is very forgiving, so an additional ounce or two of chocolate (or less) will still work depending on the exact size bag you use for chocolate chips. Just be sure the thickness of the bark after spreading out the chocolate is thick enough to handle the toppings (i.e. not too brittle). Set the bowl on top of the pot with the simmering water so that the two pieces nest together. Note that the bottom of the metal bowl should not be touching the simmering water when nested together. If this happens, remove some of the water. The steam from the simmering water is being used to heat up the chocolate chips. One word- addictive! 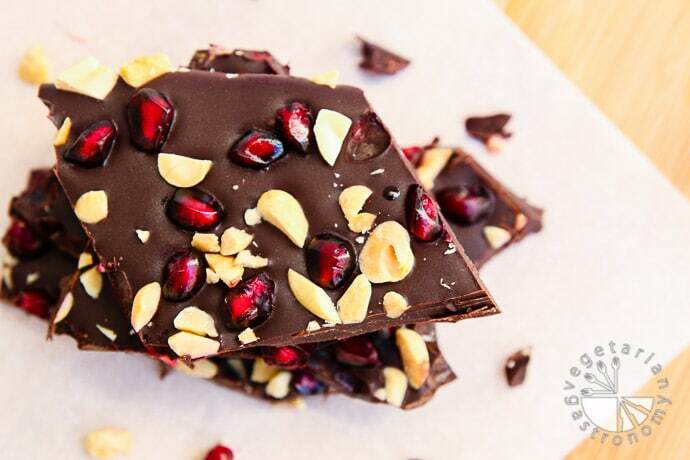 I did cut out the roasted peanuts but the pomegranate alone is a fruit explosion paired with the smooth chocolate! We'll be gifting this often when pomegranate's are in season here - thanks for sharing such awesomeness! I can't wait to try this - we need more packable snacks in this house!